Eloy Salinas’ Pet Water Warden keeps pets water topped off while the owners are away or busy. 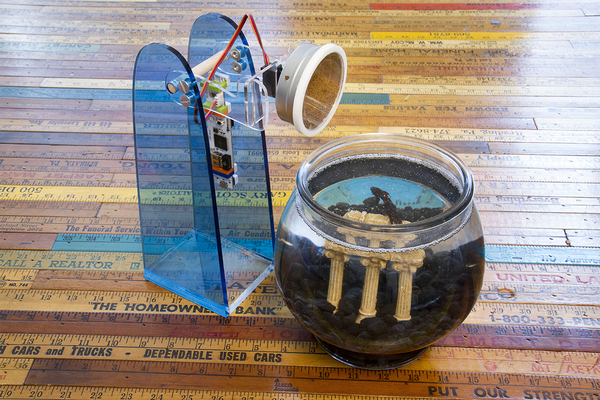 The system uses two dip probes (sensors) that are connected to an Arduino, which monitor water levels and engage a pump when levels are low, drawing water from a reservoir to refill the bowl. Pets are people too. If corporations can be labeled as people then why can’t our pets? Regardless, when it comes to our pets, we often spoil them with lavish gifts to show our affections. Makers on the other hand tend to build projects that help with everything from feeding tasks to keeping track of their location. Listed in this article are some of the more interesting and unusual projects that have been created for those ‘creature comforts’. 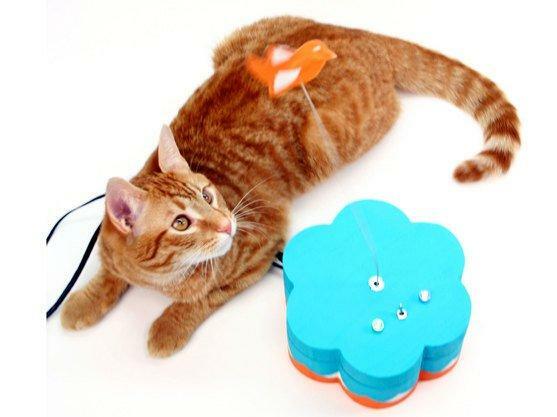 Mark de Vinck’s Kitty Twitty Cat Toy sends Twitter updates to the internet when the cat engages the toy bird. Cats can send Tweets by ‘paw slapping’ the toy bird, which sits atop a guitar string that’s connected to an Arduino. The Arduino sends the cat’s status using an Ethernet cable connected to the internet. Depending on the cat’s mood, users could find their inbox spammed with Twitter updates. Phil Bowie and Larry Cotton’s Cat Scratch Feeder helps train cats to use a scratching post rather than furniture, wood stair railings or expensive Persian rugs. The secret lies in the catnip cup located at the top of the scratch post. 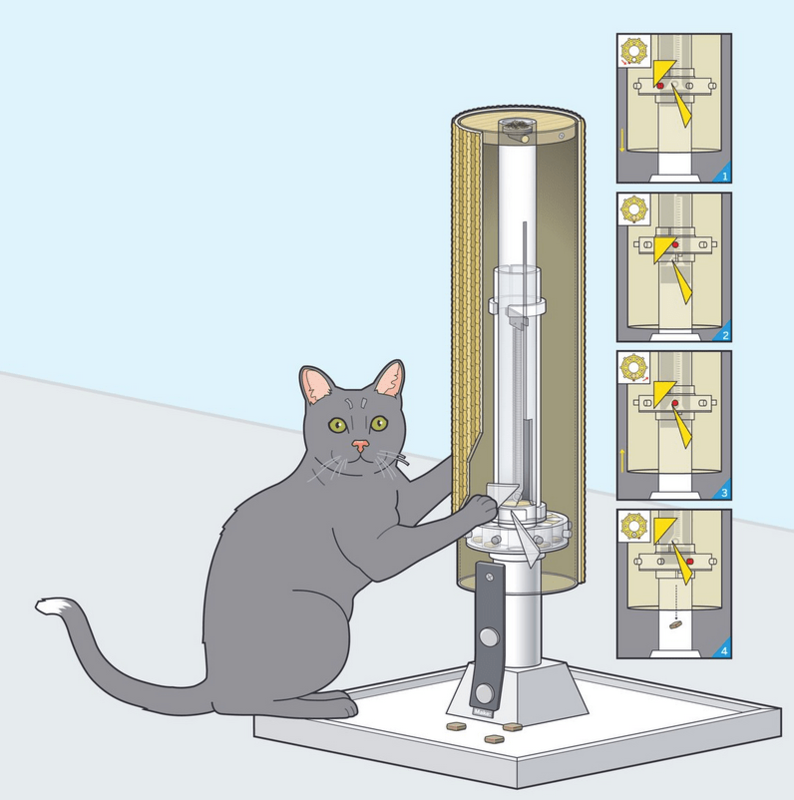 Every time a cat claws downward on the spring-loaded post, up to four treats are dispensed. The number of treats can be adjusted, allowing owners to gradually wean their cats of the delicious delectables as it gets used to using the post. 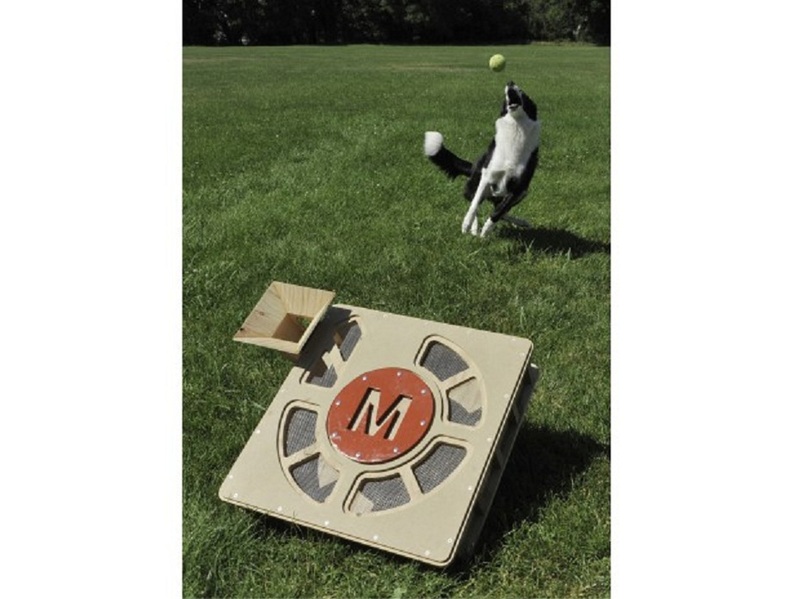 Dean Segovis’ Fetch-O-Matic is an automatic tennis ball launcher the gives dogs a workout while having fun. The secret to the launcher is the windshield wiper motor housed inside. When a ball is dropped inside the holder, it sends some power to the motor, which in turn transfers the energy to the spring-loaded throw arm and launches the ball. Those savvy enough can train their dogs to use it by themselves whenever they want to have fun. GPS isn’t just for getting directions anymore as pet owners have been using them to keep track of their furry (or scaly?) friends for a few years now due to an upsurge in pet thefts. For those of us who own outdoor pets, it would be interesting to see where they go during the day, which is why Ken Burns designed his GPS Pet Tracker for his cat Conley. 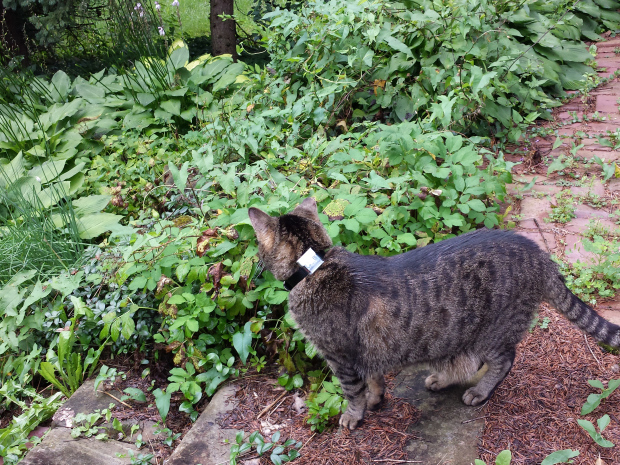 His tracker makes use of a TinyDuino that logs the cat’s location throughout the day. While it doesn’t give real-time tracking, it does allow the user to download the information and view it on apps such as Google Earth. Not every pet has fur, some have scales but they’re loved just as much and like most pet owners, there are times that they are away from home. In those cases automatic feeders come in handy, which is why I designed my Raspberry Pi Remote Fish Tank Controls (AKA- Project Goldie). 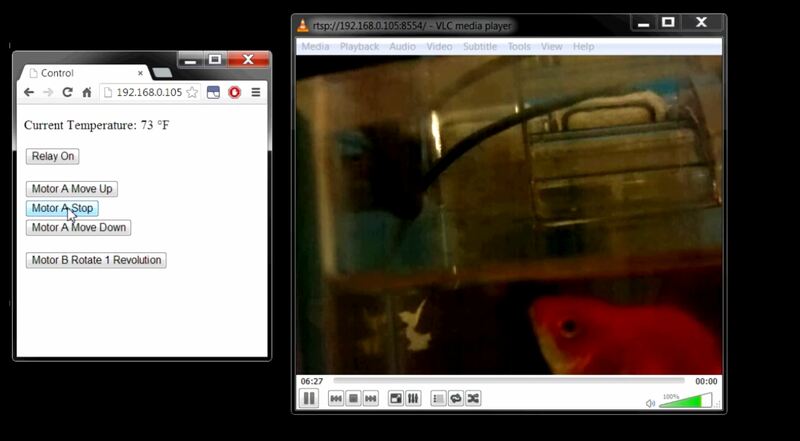 The platform makes use of an RPi, Pi camera and Arduino Uno, which allows me to both feed and monitor my fish over the internet in real time. Another interesting automatic pet feeder project can be had using LittleBits snap together modules. In fact, only three modules are needed, including cloudBit, servo and USB modules. Custom cut Plexiglas is used for the feeder frame and feeding arm, which actuates the feeding handle to dispense food. Users can operate the feeder remotely or program it for certain feeding times. Some pets love to swim but sometimes the water can become treacherous and actually harm them or worse. 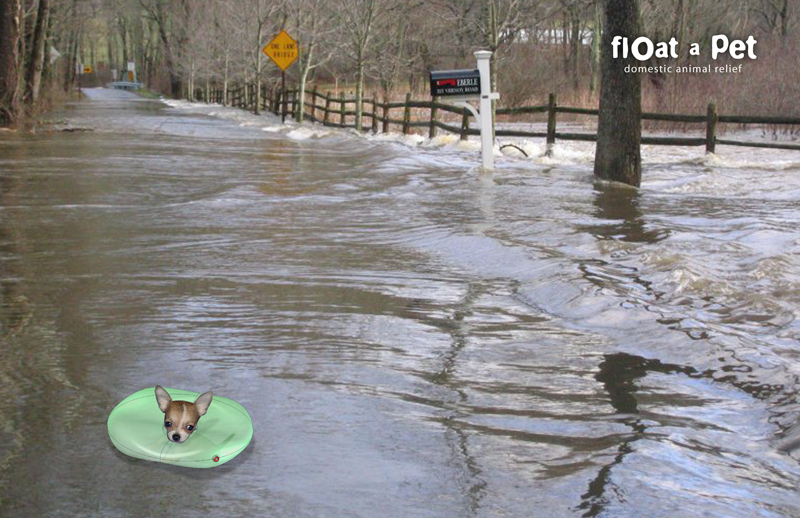 To help those water-loving pets survive those situations, inventor Jed Berks designed Float-a-Pet– an inflatable collar to keep them afloat. 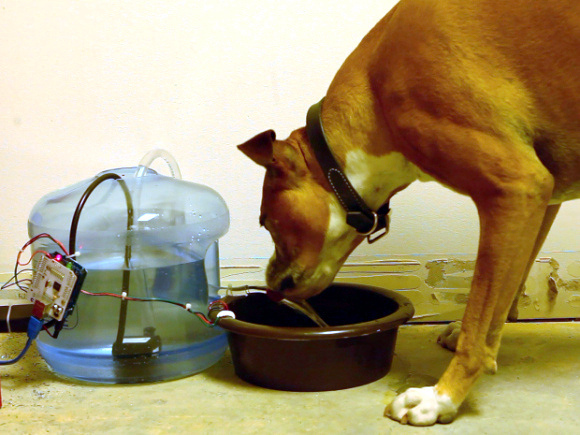 The collar is outfitted with a CO2 cartridge that inflates the collar when a humidity sensor becomes submerged. It’s also outfitted with solar powered LEDs so owners can find their pets after dark. 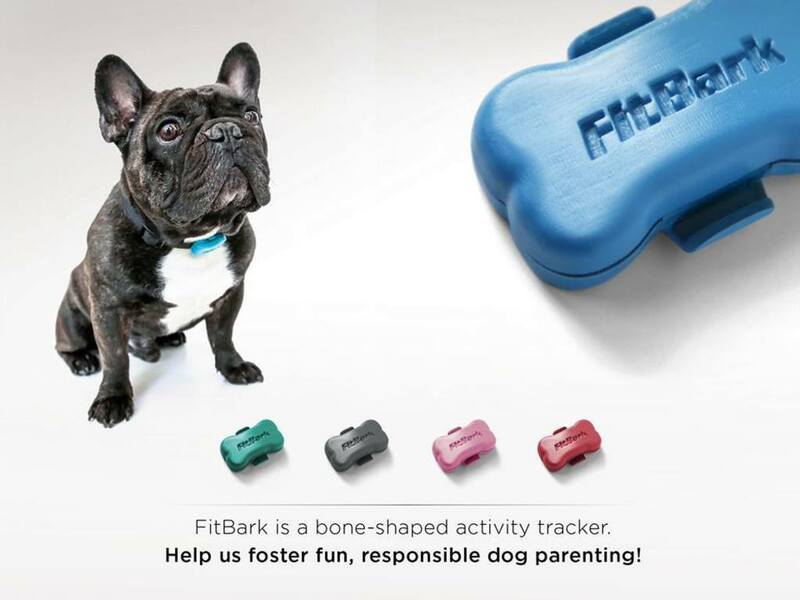 We have all heard of portable medical devices that allow patients to be monitored remotely, now are pets can be monitored with the Help of FitBark. The wearable device is attached to the pet’s collar and features a 3-Axis sensor that monitors how active your pet is. FitBark connects to user’s smartphones where they can use a corresponding app to access the data collected. Obviously, if owner’s new pet puppy isn’t active something could be wrong and the data feed would allow owners to take action. Sometimes our pets can get a little out of control when we’re away from home and other times they are well behaved, it’s in that instance that we wish we could give them a treat for not destroying the home. John from NYC CNC knows this all too well and has designed a remote treat dispenser just for those occasions. 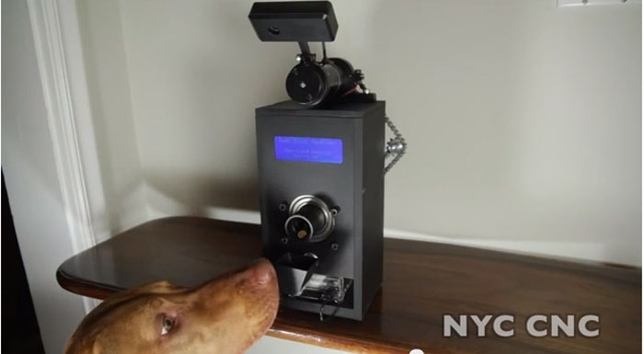 Known as the Judd Treat Machine (after his dog), the dispenser is outfitted with a Raspberry Pi, LCD and webcam to see the pet remotely and release treats as needed.